Protopresbyter-stavrophor Dr. Mateja Matejic fell asleep in the Lord on 27 July 2018. WWII refugee seminarian at Bitolj, Yugoslavia, he completed his seminary education in a displaced persons camp in Eboli, Italy. In 1949, at another camp in W. Germany, he married Ljubica Nebrigic of Srem, his helpmate, brilliant partner, and gentle conscience, who preceded him in death on April 17, 2016. The life of Father Matejic may best be summarized by his almost constant activity, a passion to work, to produce, to add something to the history, culture, memory, faith of others. In addition, with his words and deeds, he inspired others to believe, to build, to create. He was ordained as a Serbian Orthodox priest in a camp in 1951. He and his young family immigrated in 1956. As a priest, he founded two parishes and encouraged and physically contributed to the building of two places of worship, the Church of St. George in Monroe, Michigan (served 1956-1967), and the Church of St. Stevan of Decani in Columbus, Ohio (served 1967-1990). After his retirement in 1990, he voluntarily served as a temporary priest in Naples, Florida, Kansas City, Kansas, Akron, Norton, Barberton(Ohio), Hermitage, Midland, Youngwood (Pennsylvania), and Seattle, Washington, where he is given credit for helping inspire them to have their first St. Sava parish church. He continued to regularly volunteer as long as he was able. He also taught and served as Dean of the Serbian Orthodox School of Theology at the St. Sava Monastery in Libertyville, Illinois. Dr. Matejic published original works on theology, translations of early Christian texts, discovered and published unknown works of the medieval Serbian Church, wrote on the history of Orthodoxy. He was especially committed to children's education and wrote religious poems as well as plays and poems about Serbian saints, suitable for younger children. In addition to his seminary education, he attained a BA in 1963 (Wayne State University) and a Ph.D. in 1967 (University of Michigan). He taught at Case Western Reserve 1967-1968, and then in the Slavic Department at Ohio State until his retirement as a full professor in 1989. His areas of specialization were diverse, but he was especially known for his lectures on Dostoevsky and Old Russian and medieval South Slavic literature and paleography. Father Matejic was the co-founder and first editor (1967-1974) of The Path of Orthodoxy / Staza Pravoslavlja, which began as a dual-language newspaper of the Serbian Orthodox Diocese of the Eastern U.S. and Canada, and is now an official publication of the Serbian Orthodox Church in North and South America. In 1976, he established and for 20 years ran a small publishing company, "Kosovo," which published books of interest to the Serbian and Eastern Orthodox communities in North America. As a professor at OSU, in 1969, he helped found and became the first director of the Hilandar Research Project, which microfilmed the medieval Slavic manuscripts of the Serbian monastery, Hilandar, on Mount Athos (Greece), thereby making their content more widely accessible and encouraging research in medieval Slavic studies. Under his direction, in time he helped found and establish at OSU both a special collection, the Hilandar Research Library, and a small research center, the Resource Center for Medieval Slavic Studies with its "Hilandar" Endowment. Dr. Matejic had a gift for languages and was fluent in five, conversant in another three, and read six others. He was prolific as a lecturer and author. Well known as a theologian and scholar, he travelled frequently and made presentations in 23 different countries. He was the author of 49 monographs and reference works, and over 500 articles and literary reviews, many of them for World Literature Today (1976-1981). His scholarly publications, especially descriptions of Slavic medieval manuscripts, are consulted and cited regularly. His creativity also extended to poetry and literature. In fact, his first works were published at age 18 in 1942. Many of his published works are books of poems, short stories, and memoirs, in Serbian and/or English. Several poems were published in the camps. His poems, especially those inspired by Hilandar Monastery and its monks, have been published with and without attribution in several countries, especially Serbia. Some of his poems have been set to original music and performed in concerts. Father Matejic received recognition and numerous awards, beginning with prestigious academic fellowships, including the Woodrow Wilson. Later, his research and scholarship were instrumental and led to receiving grants from the U.S. Information Agency, the National Endowment for the Humanities, American Council for Learned Societies, and several research awards of The Ohio State University. For his dedication to the Serbian Orthodox Church, he was recognized as a "cross-bearer," with the right to wear a pectoral cross, similar to those worn by bishops. In 2001 he received both a Commendation and the highest award of the Serbian Orthodox Church, the Order of St. Sava. For his original poetry and literature in Serbian, the Union of Serbian Writers acknowledged him to be among the three best Serbian emigre authors of all-time. In 1988, he was accepted into the Union of Serbian Writers, and in 1996, 2000, and 2005, he received 3 separate literary awards. The city of Smederevo, which he left as a political refugee in 1944, acknowledged his many contributions by a lengthy entry in the "Smederevo Encyclopedia." In 2001, he was awarded the key to the city of Smederevo. For his contributions to scholarship and medieval studies, he was also recognized by Bulgaria. 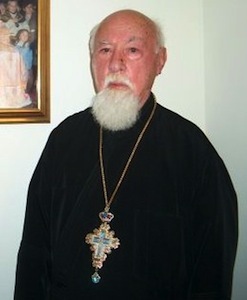 In 1978, the Bulgarian Orthodox Church awarded him the Order of St. Kliment. In 1984, he was inducted as a member of the Union of Bulgarian Writers. In 1988, he received the highest recognition of the University of Sofia, the "Blue Ribbon with Medal of St. Kliment." The Very Rev. Dr. Mateja Matejic was a classic example of a Renaissance man, "a person with many talents or areas of knowledge." His breadth and depth of interests, knowledge, and creativity was remarkable. Yet, without the steadfast support, patience, understanding, and sacrifice of his wife, Protopresbytera Ljubica, many of his travels, lectures, opportunities and accomplishments would not have been possible.